I've been struggling over the weekend trying to think of what can be said in support of Aurora United Church following the fire on Friday, April 11th. My biggest memory of the church is probably what is most likely to occur, the powerful support and warmth of not only the people of the church but of Aurora. 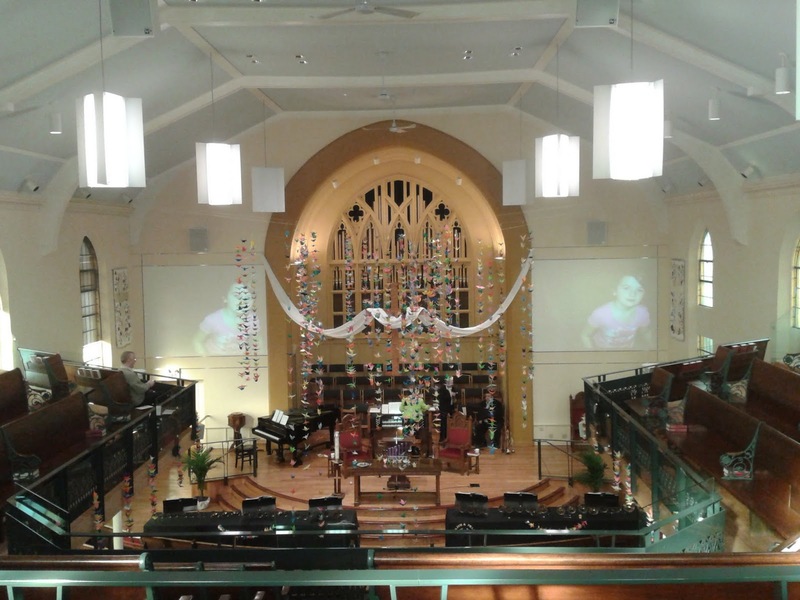 Aurora United Church is filled with warmth of not only the building, but especially the people who are willing to help out in times of need as well as celebrate with you in good times. Within the congregation itself there is lots of expertise and "person power" big and small that will show itself over the coming days, weeks and months. I don't see that changing in the future either. Over a hundred years ago, this church rallied from a fire. Back in the 1870s a fire destroyed the 2nd building on the corner of Yonge & Tyler Streets which probably lead to a similar sadness felt today. Back then, a dream was hatched to build a larger 3rd building with Henry Langley's guidance as architect. This new building would become the central nucleus of today's church with various additions to it from the 1900s, 1970s and 1980s to form the building that we know and love today. This building became the central home to a major community hub of activity with various people moving through including Scouts, Guides, Rummage Sales, baptisms, weddings, and many more. Even a certain Mike "Smarty Pants" Pearson probably spent much time in that building learning his Roman Numerals while his Dad, Edwin, carefully crafted his sermons for Sundays. Like this group in 1870s, the congregation will rise again and ensure a building respecting the past and looking forward to the future will be built so others like Mike "Lester" Pearson can have a place to enjoy life's events. The strength of the congregation I can already tell is building to get things started on the rebuild. This strength presented itself a couple of years ago at my Mother's funeral. Back then, my wife Yvonne, remarked after the 1st visitation after leaving Southlake Hospital, that a lot of people knew my mother. I chuckled and said, "You ain't seen nothing yet." Of course Aurora United Church and the surrounding community did show it's caring over the next couple of days as not only the two visitations but the funeral itself was packed with people lending their support to the Suddard family. I have seen this type of caring before with families at other funerals in the church. This strength and caring will carry this congregation through this time period of instability and help move forward. The church is surrounded by the very supportive community of Aurora and it's neighbours in Newmarket, Richmond Hill, King, Stouffville and others. The fire departments of all 9 municipalities had a hand in ensuring the situation on Friday was being cared for and Aurora was being protected. Sure King, Richmond Hill, East Gwillimbury, Aurora and Newmarket were on hand at the scene, but Georgina, Vaughan were covering the local fire halls to ensure the safety of the surrounding community. This community support continues as the Aurora Chamber of Commerce, Aurora Mayor Geoff Dawe, MPP FrankKlees, the school boards and others have come forward to help as they know Aurora United has helped a lot in the past and needs assistance now. I hope the congregation will feel this support again and I know the town's people will be there tomorrow like they have historically through times of fire, flood and great sorrow. The community also includes the surrounding churches. As Aurora United Church members witnessed personally in Aurora on Friday, Saturday and Sunday, there is lots of people and organizations reaching out to help. The "Trinitys" have obviously put out a helping hand with Trinity Anglican welcoming Aurora United to worship with them this past weekend. Trinity United has opened their doors for Good Friday service. These churches, plus other friends of faith will extend their hands to help out as I’m sure Aurora United has in the past. Finally, the most obvious two pieces of the puzzle I'm glad Aurora United has in rebuilding, Rev'ds Andy & Lorraine Comar! Aurora United Church is quite lucky to have two experienced church ministers who have been around a while, know each other inside and out. These two are going to have a key part in rebuilding and being part of the team that can point to the new church building as a success after the setbacks of last week. Years later hopefully, over a glass of communion wine, you two and the congregation will be able to toast each other at overcoming this year’s setback and look forward to a bright future. A way forward may not be clear right now, but as my Mom used to say, take things one step at a time and things will eventually work out. I believe the steps will be gradually be revealed and step by step the plan will slowly come together. During these coming days, months and years, I hope the warmth of the congregation and support of the community will be felt not only by you, but everyone at Aurora United and the town of Aurora. I believe Aurora United Church “ain’t seen nothing yet” from this congregation and tomorrow will be better for this church and it's people. It’s time to harness the outpouring of support, start the process of taking stock of what can be honoured from the church’s history and move forward to tomorrow and new possibilities. I’m personally looking forward a few years down the road to Aurora United Church worshipping in its 4th building again at the corner of Yonge & Tyler like the congregation has since 1818.